Here's a list of many of my favorite locations in and around the San Francisco area. While you are totally welcome to pick any of these locations, I am always open to ideas if you have a special location in mind or know of a pretty spot that I might not be aware of. Some things to note: San Francisco is a very, very popular spot for tourists and photographers alike. 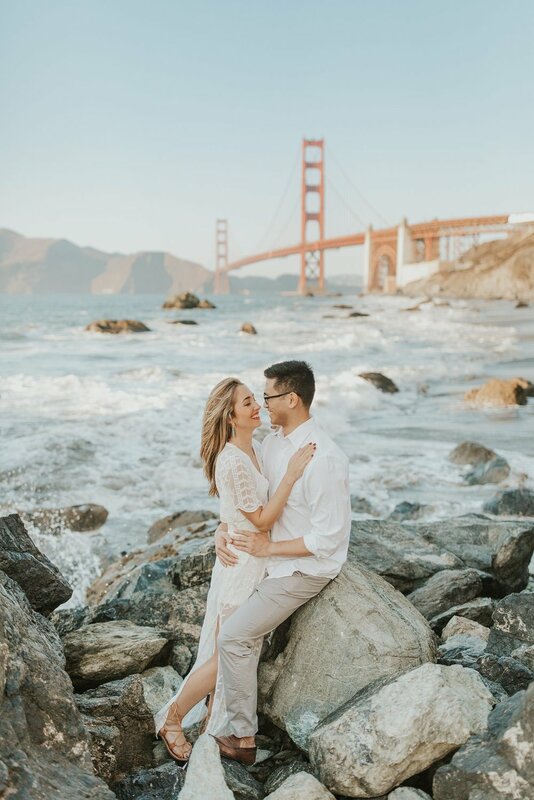 If you are planning a SF shoot and are worried about taking pictures with a lot of people around, let me know and I can discuss options with you. Weekends are almost always busy, so it is important to be patient in respect to those around us. 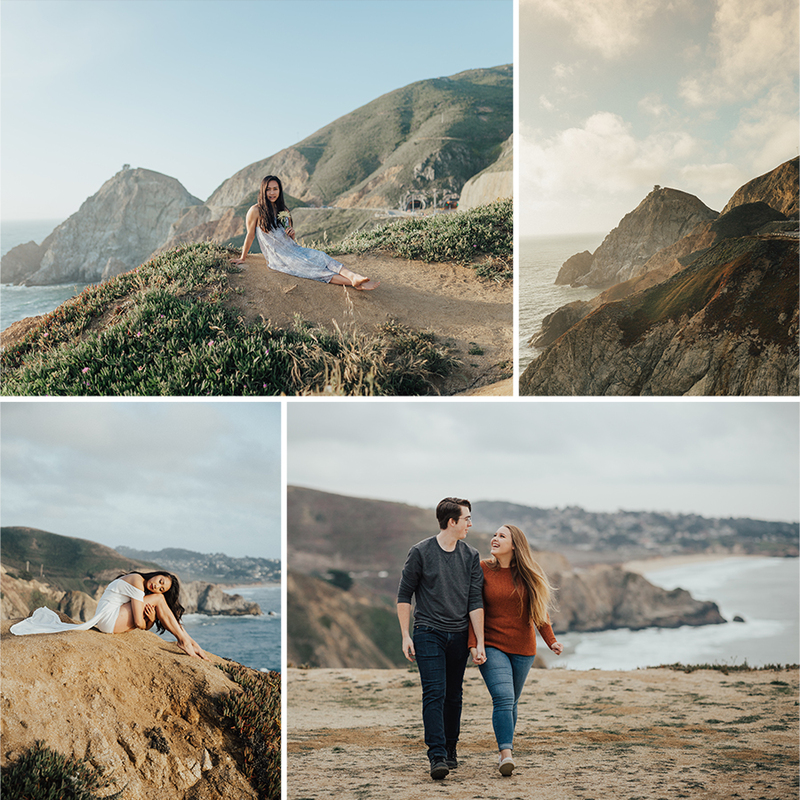 If you are able to plan an SF shoot on a weekday, the traffic in these areas is dramatically less dense and I would recommend planning for a M-Th if at all possible. Note: The Presidio has so many great locations that I've been lucky enough to explore, and probably quite a few that I haven't even seen yet. If we are planning a shoot in this area, we can probably try to hit two of these locations (yes, even for a regular session!) 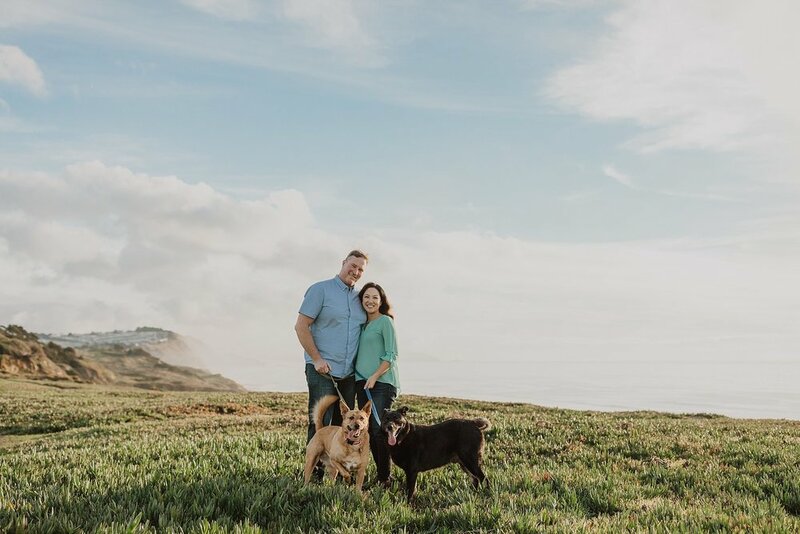 since getting between these locations generally doesn't take more than 15 minutes tops. .
Crissy Field has grassy areas for picnics, a beautiful view overlooking the bridge, sandy beaches nearby (usually with lots of dogs) and some nice white/brick walls to use as backdrops. Parking is free on weekdays and after 5/6 PM on weekends. This area has a sandy beach and some fun docks to explore. This is a great location for right at sunset since it is so open. 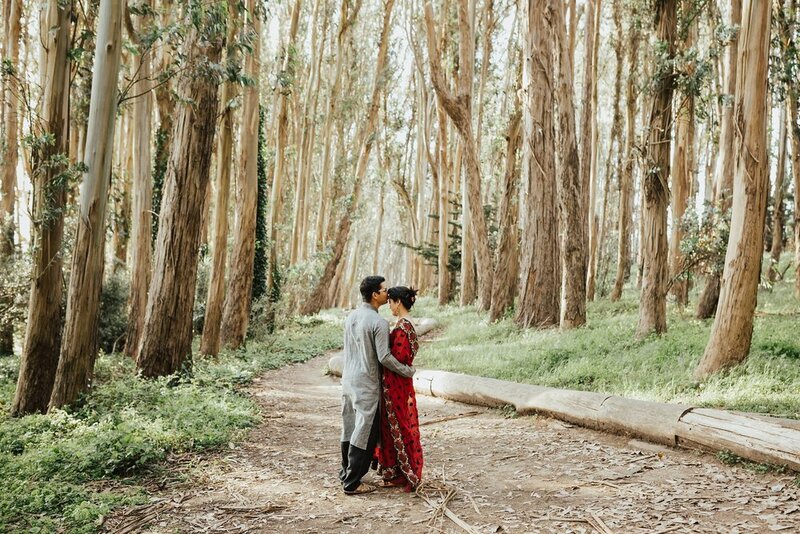 Lover's Lane is a beautiful, foresty area in the Presidio that offers a lot of shade and usually has some beautiful brown and green tones. This is a great option if you need to shoot in the morning or a few hours before sunset because the shade can provide soft light. I usually recommend parking off of Liggett Ave. for a short walk to the trail. This area can be very busy on weekends, and is a super popular photography spot, so we may have to wait our turn for the middle view of the lane if there are other photographers present. Baker Beach is the famous beach overlooking the Golden Gate Bridge. This area also has some fun cement structures to explore, lots of plant/greenery areas, and beautiful rocks to climb around on. This is another location that can get super packed on weekends, so beware of that! I almost always find parking nearby and it is free. 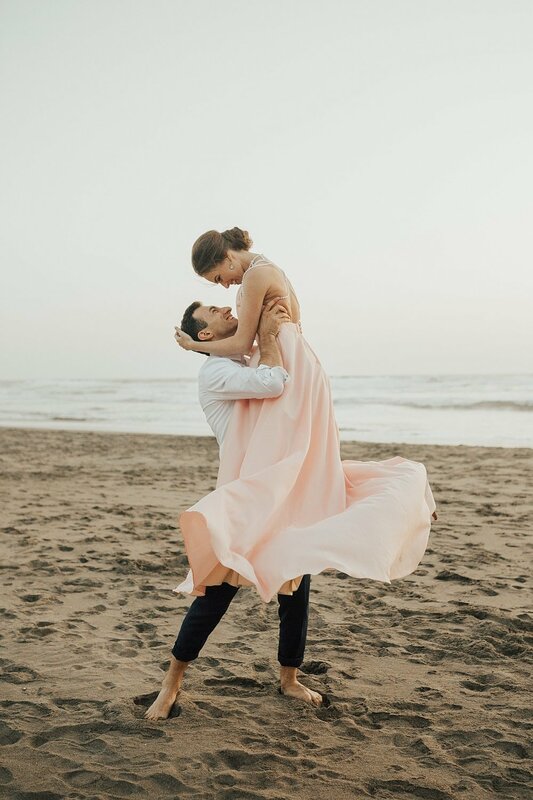 This location does require a good amount of walking through sand though! This area, which over looks the Golden Gate Bridge, is an old battery, meaning there are some awesome cement structures to explore. 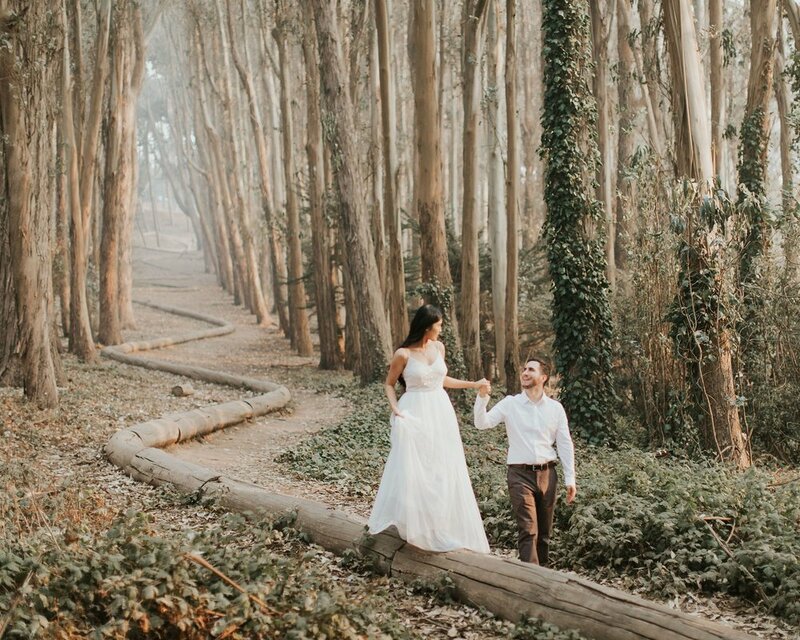 These are only a small walk from some pretty views overlooking the Golden Gate. At certain times of year, the foliage is super pretty too. Chrissy Field is a large area (which is why I have this separated). This area has some more head-on views of the bridge, some wooden staircases, and rocks to explore when the tide is low. This is one of the areas you can get absolutely closest to the bridge. We can also walk onto the bridge, though it tends to be noisy and busy so I try not to spend a full shoot there! Let me start by saying that it is a 0.7 mile hike down to this beach along stairs (which means yes there is a fun staircase waiting when we go back up!) It's beautiful and rocky and has a great view of the Golden Gate. Palace of Fine Arts (POFA) can be a very pretty backdrop, but is probably the most popular location on this list. This location is definitely not the best if you're shy. Since it's such a small area, it can stay very busy. I try to only shoot here in mornings or for half of a session, just because it can be harder to have intimate sessions when there's so many people around! 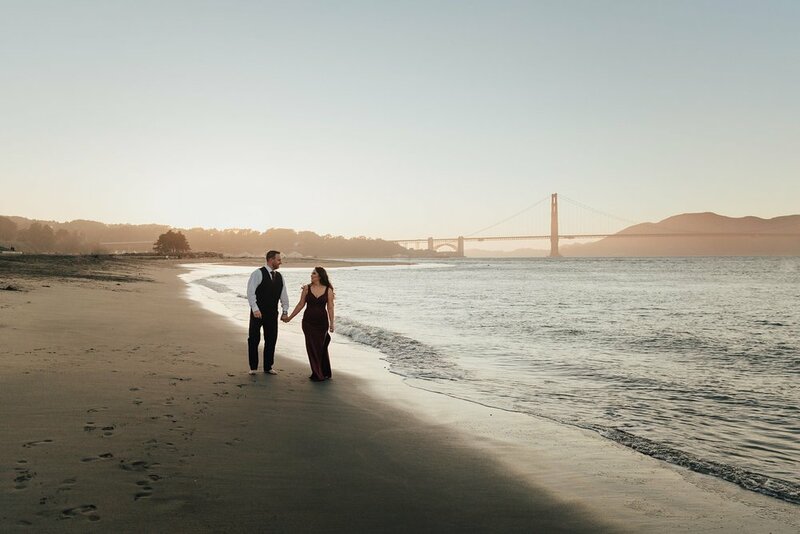 The Presidio has so many great locations. There are brick backdrops, beautiful groves of trees, cute walkways with off-white walls, staircases leading through greenery and up close to the bridge. If any of this interest you, please let me know and we can stop by one of these places during our session. These make for great second locations to add in variety to a shoot. I am not as familiar with Golden Gate Park as I am with other areas, but am always willing to explore new areas. 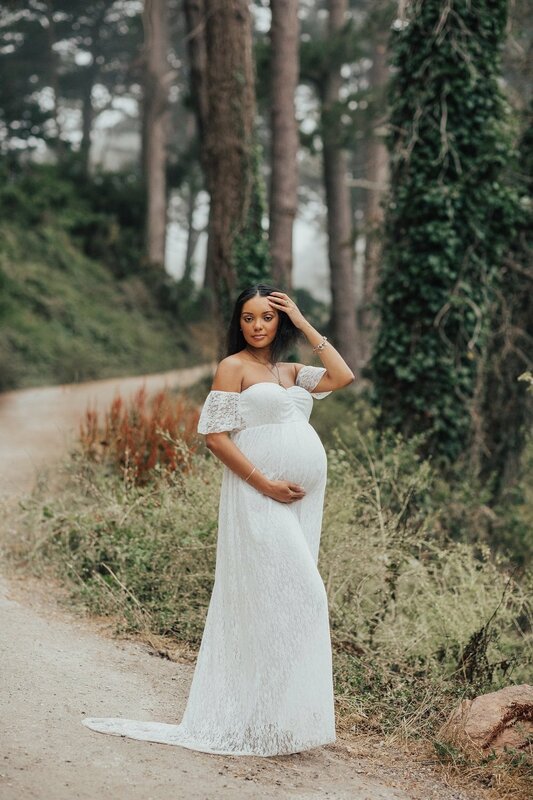 If there is an area in Golden Gate Park that you are interested in shooting at, I would be more than willing to take extra time during our session in order to discover new places. The park is fun to explore since it has lots of greenery. Stow Lake in Golden Gate Park has lots of greenery, cool stone bridges, and even a waterfall (like what??). There’s a boathouse to rent paddle or row boats as well. Though be prepared, this can be pretty logistically challenging since we’re a bit limited with out posing and it’s hard work to row a boat! Next to the Music Concourse (Flip for more images) and the Academy of Sciences. Lots of trails to explore back here! Golden Gate Park is huge so there’s lots of spots to explore. If you know spots or trails I don’t or just want to explore, we can totally do that! I always love to explore! Sutro Baths is one of my absolute FAVORITE locations. Within walking distance, you can find trees, beautiful cliff views, a lovely sandy beach, and the bath area. While this area can get busy, especially right around the baths, there are a lot of niches to explore for wide variety of backgrounds in a short amount of time. Parking can be busy, but there's usually parking right below near Ocean Beach. There is a lot of walking at this location though, and a giant staircase, so just a heads up! Ocean Beach is a long stretch of beach starting at Sutro Baths. It's a beautiful beach, and farther down there are some cool sand dune areas to explore. Parking usually isn't a problem, though since it's open, the beach is best at sunset! Out front of the Legion of Honor museum has some beautiful architecture that makes for an excellent backdrop. You can even see the Golden Gate (though small). Parking can be tough, but usually manageable. Plus, it's a 10 minute drive from Sutro Baths! It does close at 5pm though, so it's better in fall/winter during after the time change. Fort Funston, located near Lake Merced in South SF, is one of the least busy locations on the list. With beautiful coastal lookouts, grassy/sandy areas with lots of foliage on top, and a beautiful beach down some (unfortunately steep) stairs. Plus, there's always a lot of people walking their dogs and paragliding in the area, which is pretty cool to see. Parking is never a problem here. Bernal Heights is a grassy hill that overlooks the city. This location is great on overcast days or right around sunset. It does require a little bit of hiking on dirt trails, but there is a swing. 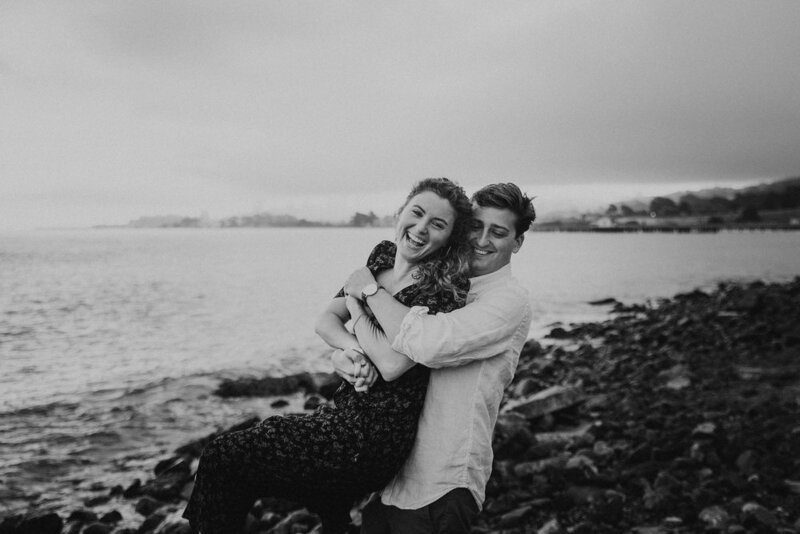 It stays pretty busy, but if you want to get pictures on the swing, we can make it happen! Gray Whale Cove State Beach is a beautiful beach in Pacifica. Located along the highway, it normally isn't too busy, minus the occasional bonfire party. 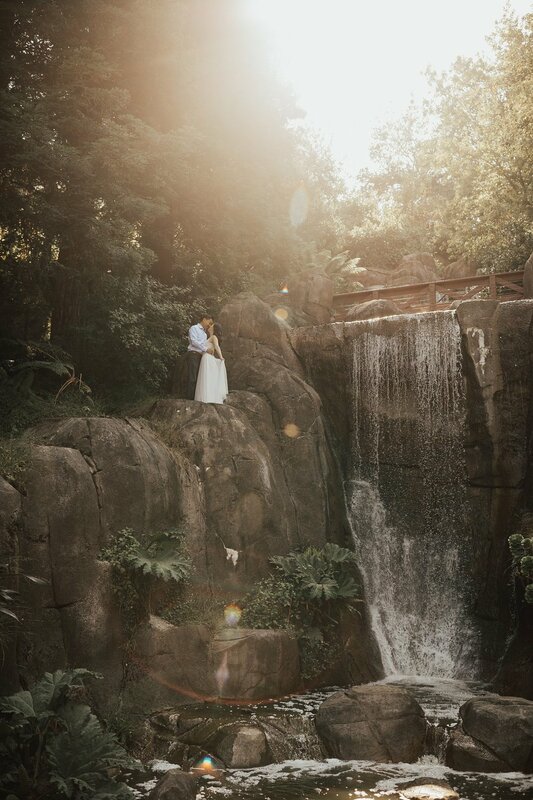 It has beautiful backdrops, rock formations, and a fun staircase that is really pretty around sunset. The tide does get pretty high during sunset, and these aren't the kind of calm waves you really want to be splashing around in, but it is a super beautiful beach. Located just South of Gray Whale Cove & Devil's Slide, this is a gorgeous beach off the side of Highway 1! I normally suggest this as a first location before Gray Whale Cove, since the two are so close to each other. 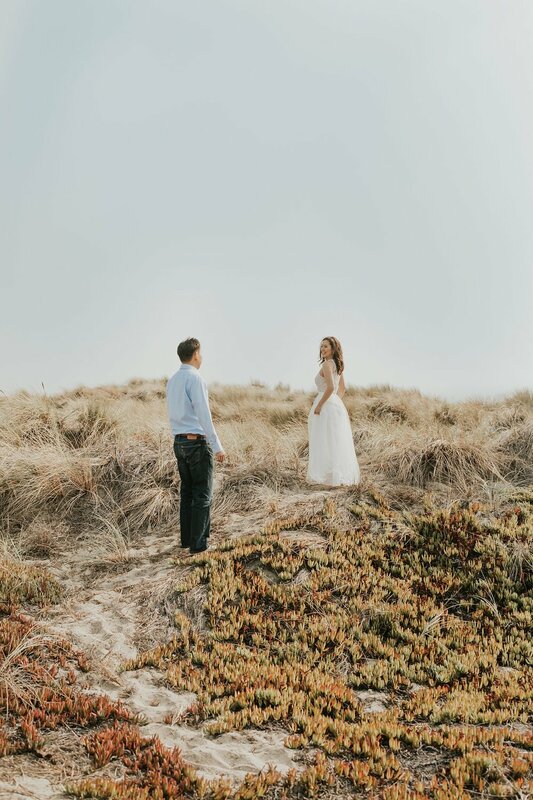 While this is not a great location if you are scared of heights, the cliff areas make for beautiful backdrops of the sea and the surrounding mountains. There is also a trail nearby to walk down and explore a bit. Parking is fairly open, just be sure to take all valuables with you to prevent break-ins. Nearby Point Bonita Lighthouse are some abandoned batteries that are fun to climb around and explore, there are beautiful coastal views (again if you are not afraid of heights), and Rodeo Beach - just below the lighthouse - can be really fun to walk around and explore. This area is not usually as busy as some of the SF Locations. 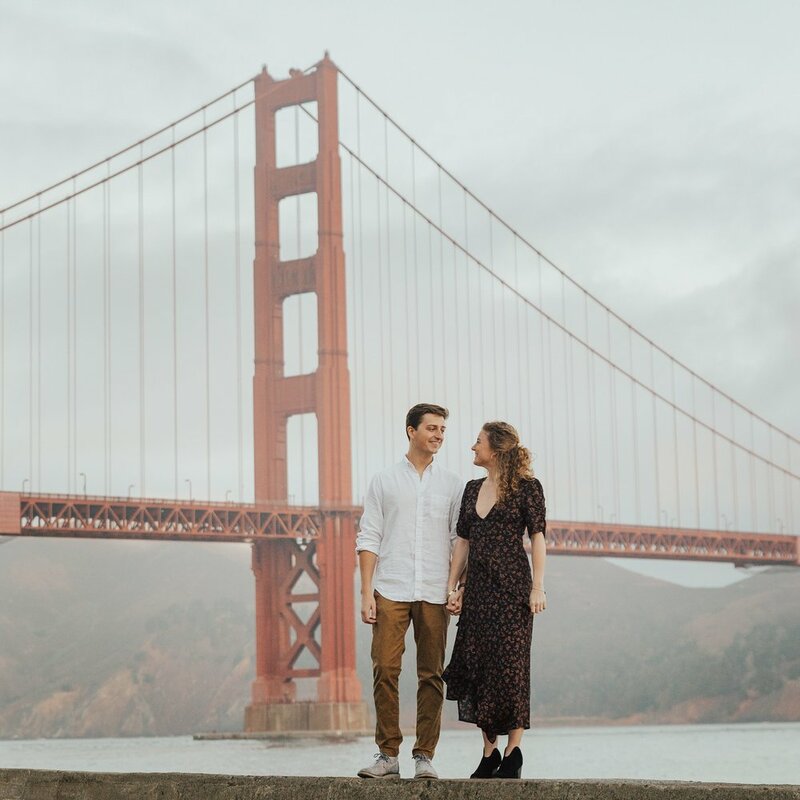 While Battery Spencer is a beautiful backdrop overlooking the Golden Gate Bridge from the north side and has some fun cement structures to explore, it can be very difficult in terms of parking. Weekdays are better at this location since parking is severely limited! 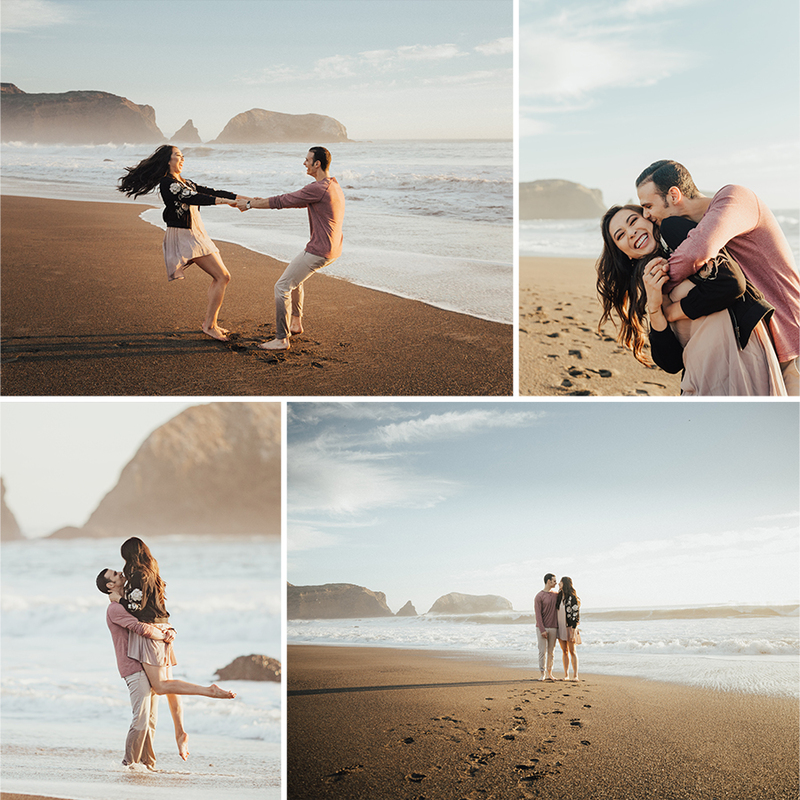 Rodeo Beach is one of my favorite beaches. It has beautiful sandy beaches with rocks in the background and beautiful cliffs on either side. Again, since this is open, it is best at sunrise or sunset. Just a few minutes down the road from Muir Woods, Muir Beach has sand, rocks, and trails to explore. Super beautiful, but usually pretty windy! While Steep Ravine is an awesome hike, there's a shorter (flatter) half-mile hike through the woods right nearby that leads out to some beautiful open hill-tops. This is one hike that is better done in the afternoon since the light is pretty shining through the trees. While it is a bit of a drive, if you head up Mt. Tam, there are tons of rolling hills and grassy fields that make a beautiful backdrop. If you're ready to explore and drive a little farther, it's definitely worth it! There are so many great locations in and around San Francisco, that I could not possibly list them all here.